AEM’s EMS-4 Universal Standalone Programmable Engine Management System (part# 30-6905) is the ideal standalone Engine Management System for modified Powersports and four-cylinder race car applications. The EMS-4 was created using AEM's powerful Series 2 hardware and includes all of its advanced features without the unneeded ancillary components. 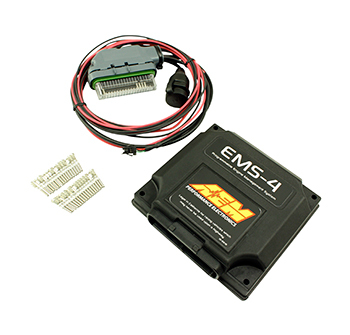 AEM’s EMS-4 provides complete engine control for small engines with up to 4 cylinders. The unit includes a 36-pin connetor that is specifically designed to operate in harsh environments. It is completely sealed and weather/shock proof, allowing it to be mounted anywhere. The EMS-4 works with MAG or HALL crank inputs and can directly drive smart coils or an external ignitor such as AEM’s 4-Channel Coil Driver (part # 30-2840). Professional tuners will appreciate the ease of use and security features of Advanced Engine Management’s AEMTuner Software. AEMTuner software is Windows™ compatible (XP, Vista, Windows7), making the task of copying, viewing and manipulating data as simple as a click of the mouse. AEMTuner Software is infinitely adjustable and allows tuners to program virtually any combination of engine control, power adders and auxiliary devices, and accurately delivers proper amounts of fuel and correct ignition timing for any boost level or operating condition. AEM offers a Universal Wiring Harness (part# 30-2905-96) with color coded silk screened wires for ease of installation and an integrated fuze and relay panel. AEM also has sensors and a Plug & Pin Kit (part# 30-2905-0) available. Use this system with EXTREME caution! The AEM EMS System allows for total flexibility in engine tuning, however misuse of this product can lead to major engine/vehicle damage. If you are not well versed in engine dynamics and the tuning of management systems or are not PC literate, please do not attempt installation/tuning of this product. For technical assistance, please visit our forum or visit our dealer locator for a Factory Trained tuner near you. AEM holds no responsibility for any engine damage that results from the misuse of this product!